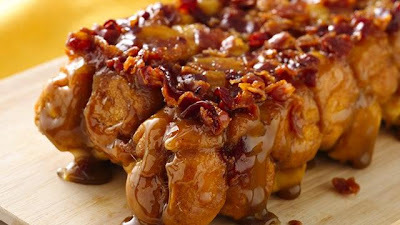 Food That Rocks: Maple Bacon Monkey Bread... People Do Say We Monkey Around! Maple Bacon Monkey Bread... People Do Say We Monkey Around! 1Heat oven to 350°F. Spray 8x4-inch loaf pan with cooking spray. 2In medium microwavable bowl, microwave butter and syrup uncovered on High 30 to 45 seconds or until hot. Stir in brown sugar and red pepper until dissolved. Stir in bacon. Evenly spoon mixture into pan. 3Unroll each can of dough into 1 large rectangle; if using crescent roll dough, press perforations to seal. Cut each rectangle into 8 rows by 3 rows, to make 24 pieces per rectangle (48 pieces of dough total). Roll each piece of dough into a ball. Arrange balls over butter mixture in pan. 4Bake 30 to 35 minutes or until golden brown. Cool in pan 5 minutes. Place heatproof serving plate over pan; carefully turn plate and pan over. Remove pan. Serve warm. 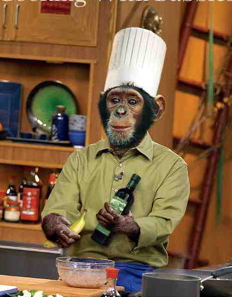 Listen to The Monkeys while cooking!